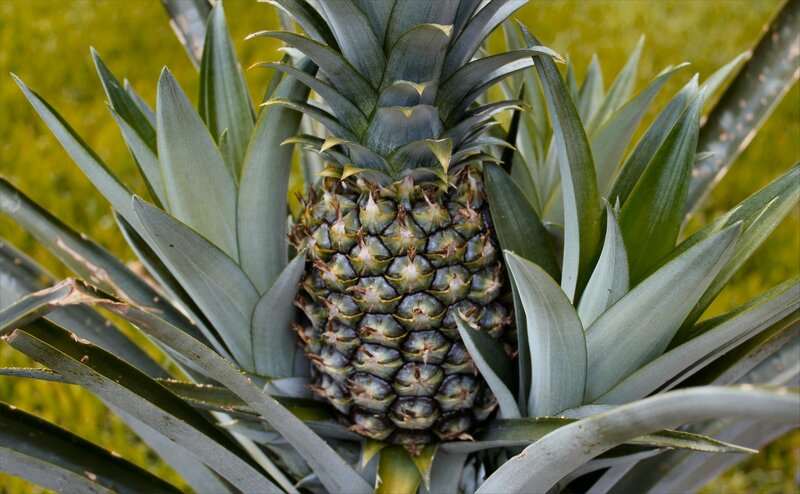 Jeanne, I do remember your pineapple plantings―which in turn inspired me to start my own. It’s exciting to see your fruitful success! Jonah Bear and Lilly Bug will be garden experts and bakers in no time. I’m looking forward to what may come from the bounty in the near future. Jeanne, I wish I could tell you the plants are thriving, but I’ve lost every one. We have hard freezes and lengthy chilly temps during our winters. I either didn’t protect them before it was too late or they didn’t like their temporary indoor home over the cold spell. But I’m not giving up! Many thanks for the lovely comment on the pound cake. The experience of steeping the lavender was aroma therapy at its finest. I know, Thoughtsy! Baby fruit is like baby animals… they’re just so cute when they’re tiny. I’m down with all of those, honey. Hadn’t thought of the Sweet & Sour Chicken ala the NYC Chinatown excursion. Holy yum, that stuff was amazing! Your #5 is appealing – Pina Coladas are tasty on a hot summer day. I wonder if I could hollow out the pineapple without destroying it. I’m thinking Best Cocktail Glass Ever! So are you going to let us know when you will be serving up these delicacies, so we can come and taste test??? Maybe. Will you bring cake if I do? ((butting in)) Oh! I love the pineapple-shell-as-cocktail-glass idea! In the interest of accessorizing, you’ll need little paper umbrellas and maraschino cherries to add to the bling. I’m down for every one of your ideas, but I’m partial to #4. Those are some good looking pineapples! Thanks, Anne. I can’t wait to watch them grow up. It’s so much fun to grow your own food. Your fish taco post has me thinking about a fresh pineapple salsa now. You know how pineapples are supposed to make you go into labor (LIES!!)? 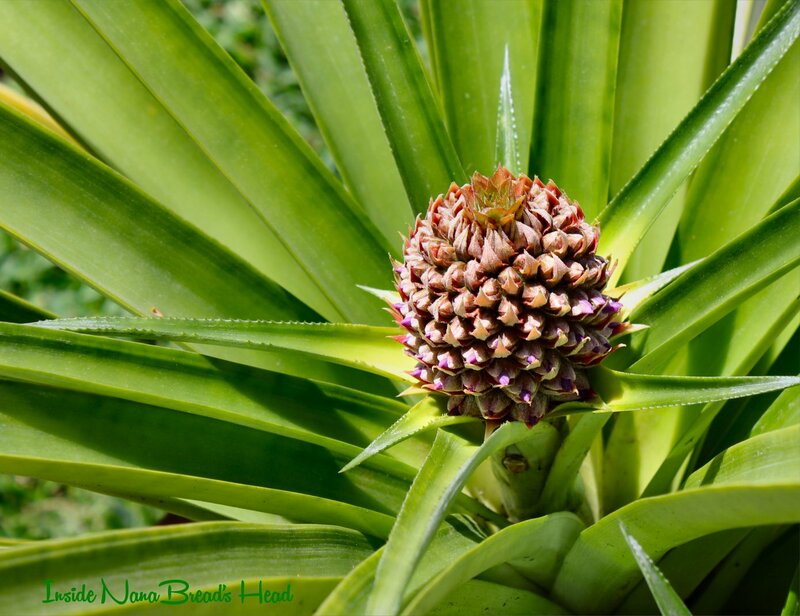 Well, my midwife told me saved the tops of the pineapples she ate before she gave birth to her kids–she now has a plant for each kid! Sarah, I’d never heard the pineapple triggers childbirth tip, but maybe that’s because it’s LIES!! hahaha I love that your midwife plants pineapple tops. That’s how we got started, and we’re 10 plants in now. We call it our mini-plantation. What beautiful babies you have raised! I wish it were warm enough here to raise some! Wow, that is so cool Jeanne! Your are so lucky to have the right climate for it :) And of course, that green thumb! You need a new name for your website now. What about insidepinemommashead? Or superjeannepineapplequeen? Speaking of growing… are those last year’s photos? What do they feed those grandkids of yours? They grow really fast! The photos of the kids were from last summer. They have grown so much this past year and they totally need to knock it off! Slow down, kids. What’s your hurry? I think you need to remedy that situation, Monica. 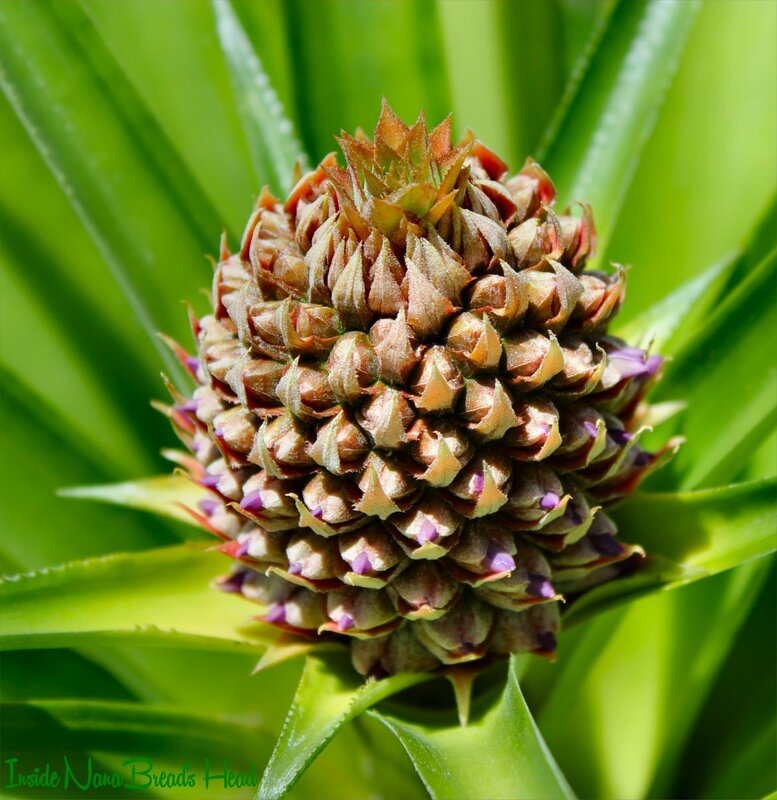 With all the tropical fruit you have growing at your Hawaiian Hideaway, pineapples should definitely be in the mix. 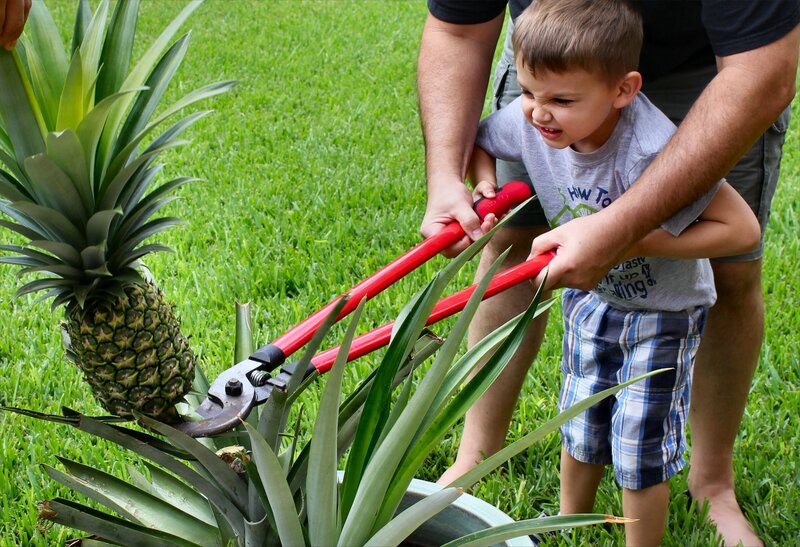 You should have Dr. Dave build you a pineapple garden. Any excuse to break out the farm equipment, right? Yippie, more little baby pineapples!! SOOO cute! Time has flown! I remember watching the very first one grow, and feeling a little sad when he was cut, but then looking at that cake….ohhhhhh yummy, so worth it! Thanks, Deb! 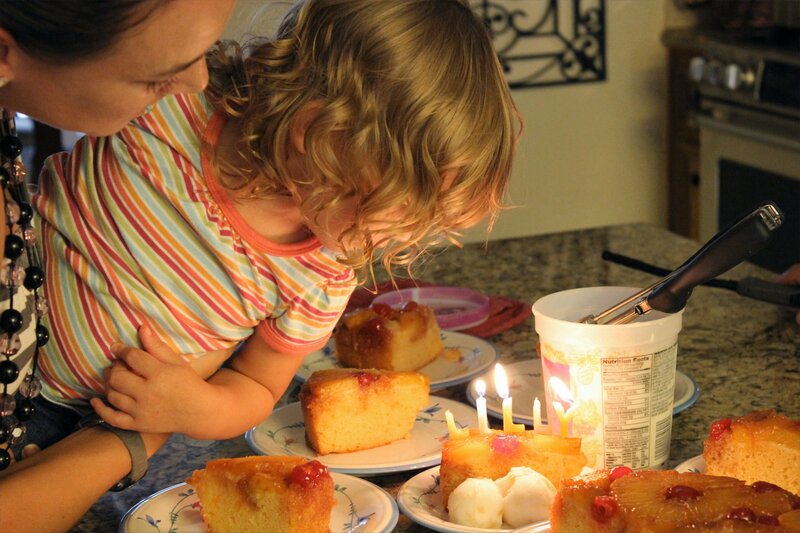 I have a feeling there will be another pineapple upside-down cake later this summer. It was too good not to do it again! This is fantastically nerdy in a food way. 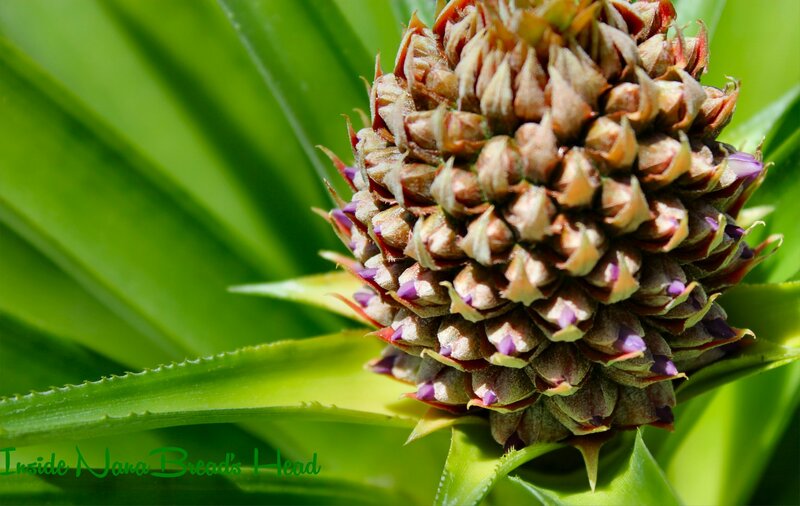 Love that you can grow pineapples in Texas! I know, right? It’s my version of Extreme Local Foods. We also grow our own bananas, which totally rocks. It’s our reward for tolerating Houston’s heat & humidity. A couple of cases of Shiner Beer & a trough of ice to put it in would also be nice, but I don’t think the state is ready to subsidize that yet. I love your pineapple babies more than my luggage. It helps that pineapple is my second favorite fruit (behind banana, of course). I’m with TCP and the pineapple cocktails! I knew you liked pineapple, but more than your luggage? That’s high praise, Mads. High praise indeed! Pretty sure there will be pina-cocktails. You’re welcome to join us (I’ll do anything to get you all to Texas for a visit).